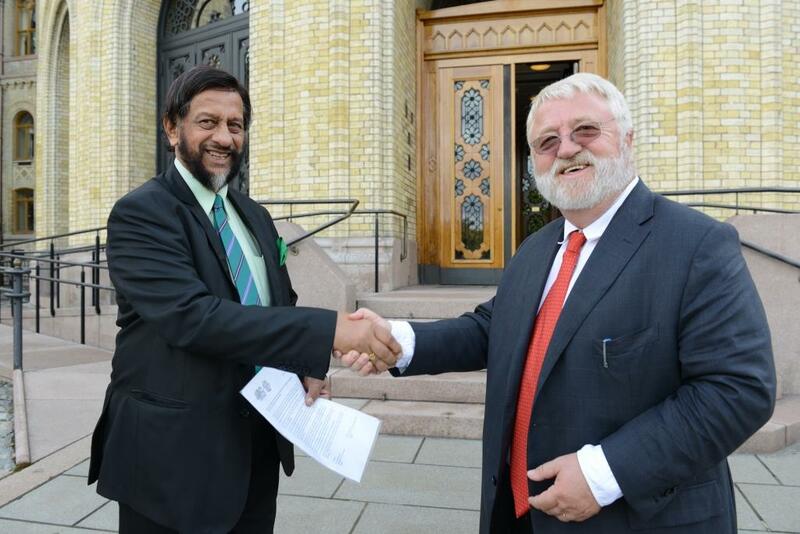 Pachauri and Tveitdal meets in front of the Norwegian Pariament building. For Our Grandchildren (4RG, Canada) and Grandparents Climate Campaign (GCC, Norway) have published a «Statement to national and international political leaders from Concerned Grandparents – united for our grandchildrens’ sustainable future». Svein Tveitdal from the GCC steering group, recently delivered the joint statement to the Chairperson of the IPCC, Rajendra Pachauri. Tveitdal says that seniors have an obligation to put pressure on political leaders to take action. – Our generation benefitted most from the fossil fuel economy. We must now pay back and work to correct a situation to which we have contributed. By publicizing this statement we hope to awake a stronger sense of responsibility amongst politicians and grandparents of the world, says Halfdan Wiik (Chair, GCC). We will circulate the statement widely in connection with the September UN Climate Summit and People’s Climate March. Members from both organizations will join forces with thousands of others who share our values. – We are impatient, Wiik explains. We know a fair global climate regime will cost a lot of money. Yet, the costs of continued inaction will be much greater! It’s a question of cleaner air, energy safety and improved health for all the Earth’s citizens.